This shot is as-is out of the camera, uncropped. After my free-writing group let out at around 4PM, I spotted a couple of members bent over by a tree on the art center property. When I went over to investigate they offered me a wonderfully sweet fruit. Persimmons are astringent when picked off the tree, but the ones on the ground are simply delicious. I took a couple home for Mary (who has plans for the seeds) and almost drove off before I realized I could make good use of my camera. 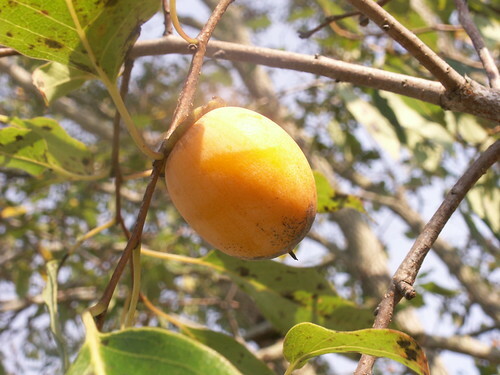 Diospyros virginiana, Family Ebenaceae (ebony family). 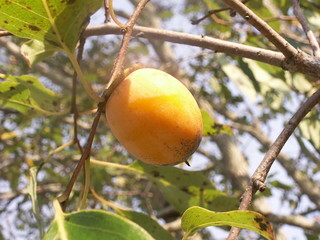 Says www.floridata.com/ref/D/diosp_v.cfm, "Persimmon is native to eastern North America from New England, west to Kansas, and south to Texas and Florida. It is one of the most widely-adapted of trees, growing naturally in bottomland swamps, along stream banks, in upland forests, in fields, piney woods, and even dry scrub lands." More detail is in the large view (click the magnifying glass).